DM8168 Video Software provides a multi-channel software framework for the TI DaVinci DM81xx family of media processors. Our HD video software unleashes the full multi-channel potential of the DM8168 and DM8148 with multiple simultaneous SD and HD video channel solutions using standard video decoders such as the TVP7002, TVP5147, TVP5158 and the SiL1161. The DM8168 video software provides a high-level API with support for industry standard VoIP protocols, custom signaling, and innovative features to maximize interoperability. VOCAL’s DM8168 Video software is compatible with TI DM8168 and DM8148 based designs from other vendors and may be licensed either as a library or as part of a complete HD video solution. Custom designs are also available. Please contact us to discuss your DM81xx video software application requirements. 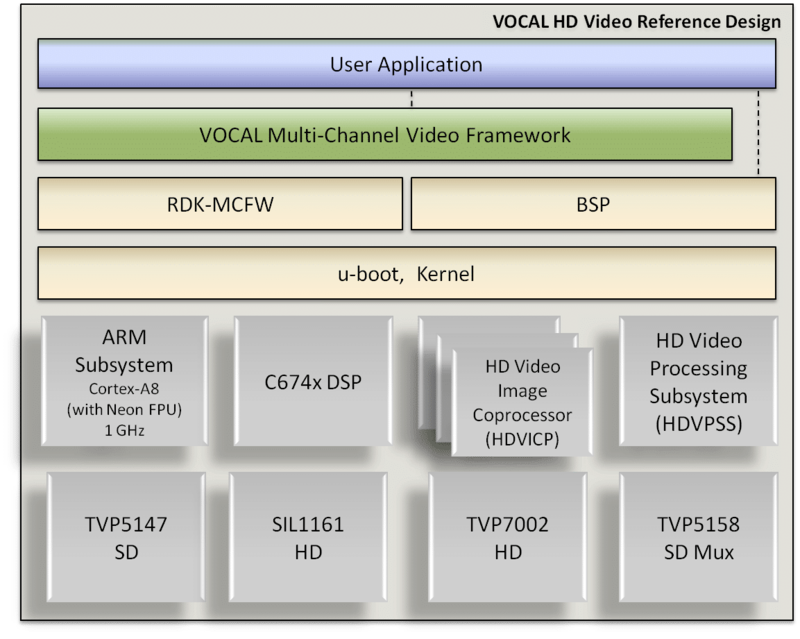 VOCAL’s DM8168 Video Framework leverages the links and chains provided by TI’s RDK-MCFW to support true multi-channel video for DM8168 and DM8148 based systems. The DM8168 video framework provides a middleware layer between the user application and the MCFW and BSP with API functions and features not available in the basic MCFW or BSP. VOCAL engineers tailored the standard EZ-SDK and BSP to support these additional features implemented in our Video Framework while still allowing the user application access to specific functions provided in the BSP. VOCAL’s DM8168 Video Framework provides access to H.264 and MPEG-4 video compression algorithms and VoIP protocols for smooth video capture and display with the DM8168 and DM8148 media processors. The HD Video API also supports VOCAL’s Voice Quality Enhancement system and other software libraries with a broad range of industry standard audio codecs and noise reduction, echo cancellation, dereverberation, and beamforming algorithms. The combination enables application developers access to full wideband audio and high definition video compression software to create a superior audio and video experience using DM8168 and DM8148 media processors.